If you are considering LASIK surgery for your eyes then you must have come across terms like blade lasik vs bladeless lasik and you must be thinking about which type of LASIK you should go for- Blade or Bladeless? Well, let me first inform you that BOTH of these procedures are equally SAFE and EFFECTIVE. So, what do blade and bladeless LASIK mean? What are the differences between these two? Before explaining the definition of Blade and Bladeless LASIK, let me give you an introduction of LASIK as a whole procedure. LASIK is surgical treatment for rectifying the common refractive errors such as Astigmatism, Presbyopia, Myopia and more by reshaping the cornea. In this treatment, a small ‘flap’ is created on the corneal surface of the eyes and the cornea is reshaped accordingly by removing the tissues from the eyes. The removal of the adequate tissues allows the light to enter into the eyes and reach the retina properly to give a much clearer vision! Now, in LASIK, there are two approaches used to ‘flap’ creation: One is Blade LASIK and the other is Bladeless or ‘all LASER’ LASIK. In Blade LASIK or the traditional LASIK, a small thin ‘blade like’ device known as Microkeratome (which is disposable) is used to cut out the flap in the patient’s cornea. The thin flap is then raised to a certain microscopic height and the cornea is reshaped by application of Laser. On the other hand, ‘Bladeless LASIK’ was introduced back in 1999. It uses a high –energy Laser known as fem to second Laser for the creation of the flap in the cornea. 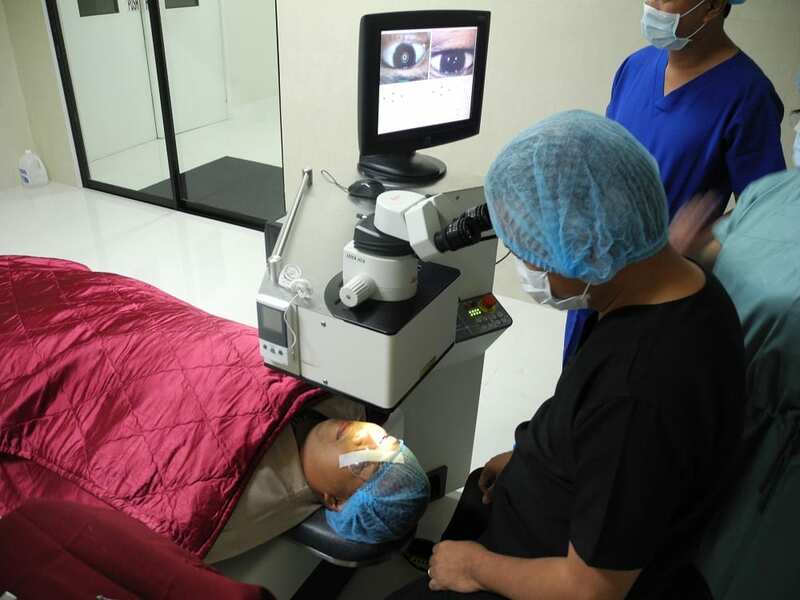 Later on, more high-tech LASIK technology was introduced which consisted of much precise LASER work. The first FDA approved ‘Bladeless’ LASIK is the ‘IntraLase LASIK’ which was adopted in the year 2007. After that, there were several other new kinds Of ‘Bladeless LASIK’ which was approved by FDA such as zLASIK (Ziemer Ophthalmic Systems), Femtec (2010 Perfect Vision) and Visumax (Carl Zeiss Meditec). The new femtosecond LASER took over the traditional Microkeratome like storm and became more popular than the blade one. However, surgeons around the world have different opinions about the use of the traditional and the ‘all LASER’ LASIK. Which surgery is good for you? Both surgeries have their own pros and cons. They also carry set of risks with them just like any other surgery. No surgeon can fully assure you that everything will go right before, after and during the surgery. But still, 92-96% of the LASIK surgeries around the world have been successful. Now when the question is asked which method of LASIK is better one, there are varied opinions of surgeons. 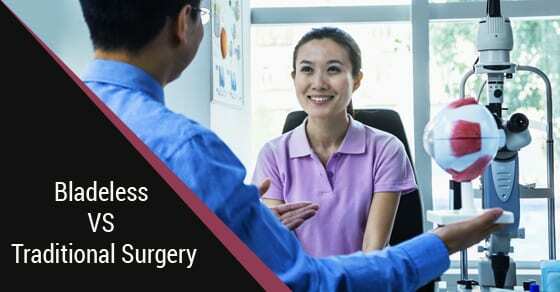 However, it’s better to go with the surgery which the surgeon is more experienced in! There have been several debates on the issue of ‘Blade vs Bladeless’ and turns out that both these surgeries get almost the equal point. Here is the debate between Brian Boxer Wachler, MD, BoxerWachler Vision Institute, Los Angeles and Vance Thompson, MD, Sioux Valley Clinic refractive surgery director and assistant ophthalmology professor at the University Of South Dakota School Of Medicine. LASIK surgeons, who find Microkeratome more preferable, object the use of “Bladeless” for IntraLase LASIK since using the word ‘Blade’ for Microkeratome causes fear in the patients! What’s your opinion in this? Thompson: The term is absolutely correct; it’s good that the truth is only being advertised. If for IntraLase there is no ‘blade’ used then ‘Bladeless’ is an appropriate term. But referring the technology “ALL LASER” might be more suitable. Boxer Wachler: Technically IntraLase doesn’t use ‘blade’ so ‘bladeless’ is a reasonable term. However, some people find the use of “Bladeless” term for IntraLase not appropriate since it would imply that the ‘microkeratome’ uses Blade, which is actually right, but this seems scarier to the patient. Hence it creates a wrong notion about the ‘Microkeratome’ that it’s not safe, when the fact is it’s as safe as the IntraLase. What are the advantages of modern Microkeratome over IntraLase Lasik flap makers? Boxer Wachler: I go for whatever is best suited to my patient. But yes I use more Microkeratome procedure than the IntraLase one. I feel that Microkeratome are much faster and the patients are also more comfortable with it. The suction during Microkeratome happens more quickly, in about 3 seconds whereas in IntraLase the suction takes about 15-20 seconds. Plus, there is less suction on the eye during Microkeratome procedure so, I prefer using Microkeratome as patients are more comfortable with it. What are the advantages of IntraLase over Microkeratome? Thompson: I use both the surgeries according to the patient’s wish and comfort. However, I like using the safest technology for my patients. When The Laser Flap technology, IntraLase was approved in 1999, I realized Microkeratome was the main source of vision threatening complications in LASIK: Free caps (Unattached Flaps), Partial Flaps, Buttonholes (Improperly developed flaps) or epithelial slough (damaged cornea tissue). I found out that even though most of the Microkeratome surgeries went well, but at the same time many didn’t. Honestly, it was ugly! MUST READ Who is Dr. William A Boothe in Dallas | Is He Best LASIK Surgeon? So, when IntraLase was introduced I liked it very much. After that, I didn’t have to worry about buttonholes, Partial flaps, free caps or any other complications that earlier my patients came with. I felt more relaxed and in peace during the surgeries, especially during the flap creation. My staffs were also quite happy with it because the majority of the complications lessened. Our operating days were much happier and in peace. What is your opinion on the quality of flap creation with both the types of LASIK? Thompson:I feel the flap predictability is much better with a LASER. I am much more confident with it. Boxer Wachler: I would like to share my personal experience to answer this question. I never had a free (detached) flap occur in 5 years while using the modern Microkeratome procedure. Buttonholes (distorted flap) happened very rarely but these have happened with my patients who used IntraLase as well. So, I would say that Flap complications can happen with both the Microkeratome and IntraLase technologies. The thing that actually matters is whether the patient is at the hands of an expert surgeon because tools work as good as the ones who use them. Thompson: I haven’t heard about any case of Buttonhole flap happening with IntraLase in my career. I think buttonhole occurs when the flap is too rough to be lifted. But with Laser Buttonholes aren’t possible since you get equal thickness flap with the laser. However, in blade ones, curvier cornea leads to thinner flap centrally which increases the chances of Buttonhole formation. What would you tell your patients regarding the possible complications which may happen in both the types of LASIK? Boxer Wachler: If Modern microkeratome technology is used, then I feel there is no need of IntraLase to create the flap. It has been debated earlier that Microkeratome creates Meniscus flap (thinner middle) but till date there hasn’t been any consensus data that a planar flap (equal thickness flap) is any better than other. 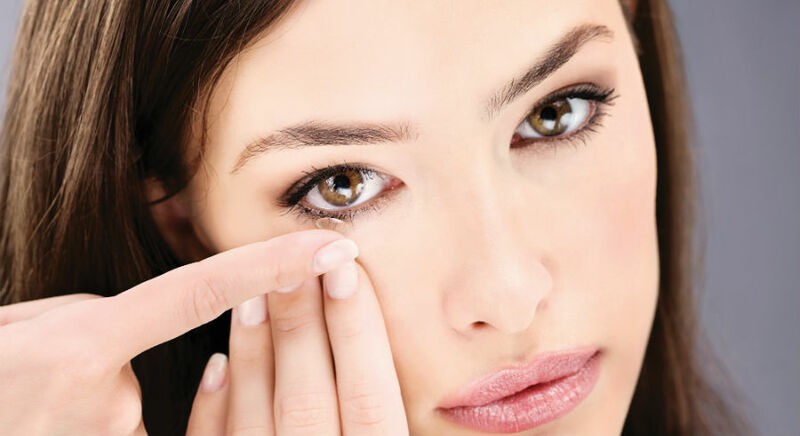 However, there are more chances of edema (swelling) of the flap with IntraLase LASIK. This occurs because the additional energy from the laser delays the vision clarity for few days to weeks. But the same doesn’t happen with Microkeratome. Thompson: I would tell my patients that with Microkeratome the chances of Partial flap, hole in the flap or any other flap completion is comparatively higher than LASER. The blade made flaps are meniscus whereas Laser flap are Planar (Same thickness at the centre). Several studies have already proved higher order vision problems are more with Blade. Boxer Wachler: But in IntraLase the problem of transient light sensitivity is higher. Although it’s a low risk but it’s a risk only with IntraLase. Thompson:at least it’s less threatening than a hole in the flap! Boxer Wachler: Flap holes have occurred with IntraLase procedures as well. What would you inform your patients about the safety of Blade or Bladeless LASIK? Boxer Wachler: The truth is LASIK is one of the safest refractive errors correcting procedure be it IntraLase or Microkeratome. Thompson:It’s quite difficult to differentiate between flap creation with Modern microkeratome technology and Laser Technology. The only difference, I find in them are the various complications due to these two technologies. Although, yeah, the figures have proved that 99% of Flap complication in LASIK have caused with Microkeratome procedure. Note: Both the surgeons support the use of only the best and latest forms of Technology for LASIK. Conclusion: Both Microkeratome and Laser surgeries have their own complications. So, it’s suggested that you choose the one which is most suitable for your eyes and only an EXPERT can tell you about it. You may go through several tests to ensure which is the best surgery for your eyes. Since it’s the matter of your eyes therefore some extra money on the tests is not a big deal, I guess. So, if you planning on having LASIK, it will be best if you go through all the pre-tests required and get only the most suitable procedure by the hands of an experienced surgeon!